This page is for the original release. For the Deathinitive Edition, see Darksiders II: Deathinitive Edition. The game has been ported poorly with numerous configuration and launching issues. Cannot be purchased digitally anymore as this original version has since been replaced by Darksiders II: Deathinitive Edition. 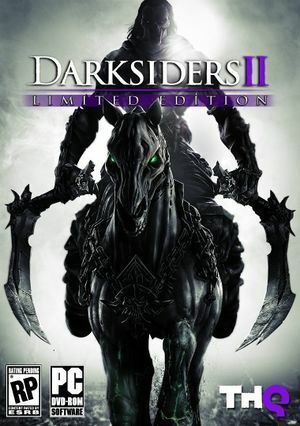 Players owning the base game and DLC can unlock the Deathinitive Edition at Darksiders II Deathinitive Edition Redeem. Delete or rename 2011_THQ_Logo_FadeOut_720p.bik and Vigil_Logo1280x720.bik. Limited support. Widescreen Fixer is recommended. 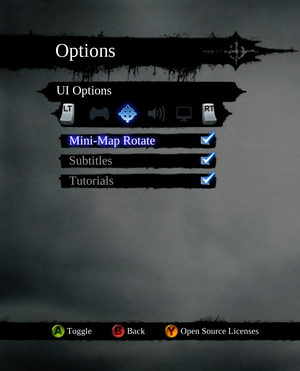 The settings are only available after the cinematic introduction displayed when starting a new game. No real "Main menu" before starting/loading a game. No option to disable mouse acceleration. Some keyboard keys cannot be mapped to game commands, like Delete, or num_del, Insert keys. Also, Arrow keys, END, HOME, PGUP, PGDN, etc. are displayed as "UNKNOWN KEY" then setting it again displays as NUMPAD keys. 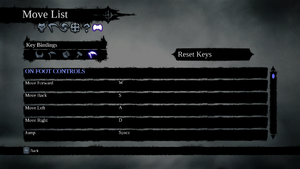 The "UNKNOWN KEY" can only be bound once. Arrows are functional still after this binding as NUM keys, but you cannot bind any NUMPAD keys as it is seen as already bound. "I" is hardbound to PAUSE, so that is also not "remappable". If a key is already bound, you have to remap the action using that key before you can use it. This sends you on a goose chase if you need to remap the majority of the keys. Each time you set a key your entire page scrolls back to the very top so you need to scroll all the way back down again (using your w,s,UP,DWN keys that require constant pressing as holding does not scroll, and cannot use the mouse scrollwheel) to get back to the section you were configuring. Use Helix Mod: Darksiders 2 for the best experience. 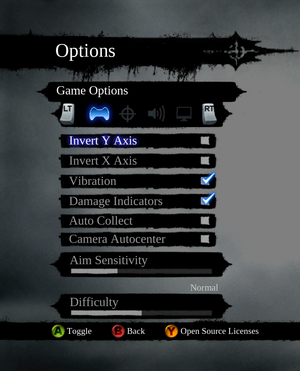 If you are using a Nvidia GPU, go to the Nvidia Control Panel -> Manage 3D-settings (I think, mine is in Norwegian so I translated directly) -> Software settings tab -> Press the "Add" button and find Darksiders II -> When configuring the settings for Darksiders II in the control panel, scroll down to the Vertical Sync settings and set it to "Adaptive". Extract d3d9.dll and antilag.cfg into the installation folder. Pausing, selecting "Quit Game", and then resuming should fix this issue. If it doesn't, try disabling the DLC. Caused by uncapped frame rate. 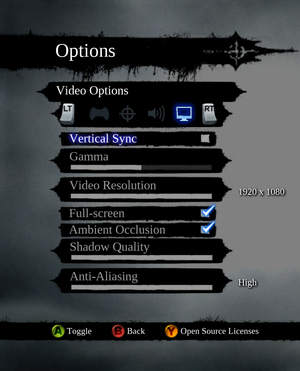 Enable vsync in the video options. If all else fails, copy the files from the Skyrim Stuttering fix into the Darksiders II installation folder. The issue can also be fixed by enabling vsync (and preferably triple buffering) and using a frame limiter. The issue can also be completely fixed by setting Nvidia (pre-rendered frames) or AMD (flip queue size) to 1 . Refer to D3DOverrider to force vsync to limit frame rate and temperatures. Caused by slowdown in internet connection as game checks for THQ account. Using 3D Vision in the game is subpar to what it could be, with effects and shadows not rendering at the correct depth. 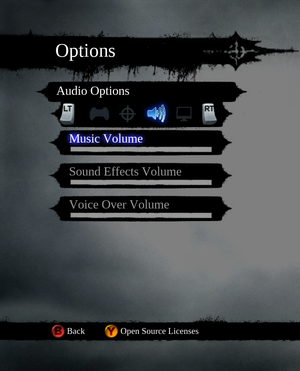 Region locked copies may lack voices and subtitles, when language is changed to anything other than language native for their region. Find Darksiders 2 on the list and right click on it. Go to a Language tab. If the fix above doesn't work. If you don't want to move the game without redownloading it follow these steps. Go to a Local Files tab. Choose a location for your backup. When the backup is complete, go back to the Local Files tab. Choose Restore from a previous backup and then browse to where you saved your backup. When it asks you where you want to install the game, make a new Steam library on your primary HDD and install it there. ↑ 1.0 1.1 File/folder structure within this directory reflects the path(s) listed for Windows and/or Steam game data (use Wine regedit to access Windows registry paths). Games with Steam Cloud support may store data in ~/.steam/steam/userdata/<user-id>/50650/ in addition to or instead of this directory. The app ID (50650) may differ in some cases. Treat backslashes as forward slashes. See the glossary page for details. Polish works without problems, but when changed to English - game lacks both subtitles and voices.